urbanbaby&toddler magazine: Elf on the Shelf: Does it Really Improve Kids’ Behaviour? Elf on the Shelf: Does it Really Improve Kids’ Behaviour? Encouraging good behavior after Elf on the Shelf heads back to the North Pole. He sits on the shelf, keeping a watchful eye over your house as Christmas approaches, reporting each day’s household behavior to Santa at night. He’s the Elf on the Shelf, and he seems like a parent’s dream for encouraging good behavior in the chaos before the holidays. Knowing their poor choices will be reported to the big guy up north and keep them off the good list, your kids will probably step up while the elf is perched on the mantle. But what happens when the elf heads back to the North Pole after Christmas? Don’t get me wrong – we’re not down on the Elf on the Shelf. After all, watching the elf’s antics and discovering where he ends up every morning is fun for the whole family. However, using the elf (or Santa) to manipulate kids’ behavior is unfortunately not a long-term solution to bringing out the best behavior in your kids. Elf on the Shelf may seem like a great help during the holiday season – just like the age-old threat of “Santa is watching!” – but kids are quick to revert to their old ways once the reward of presents is removed. And would you really withhold that new scooter or train set on Christmas morning because the Elf spied your daughter sweeping cookie crumbs under the rug? Fortunately, it is possible to help improve your kids’ behaviour through the anticipation of Christmas and even beyond, even without Elf on the Shelf. Offering kids rewards for positive behaviour – a sucker for picking up toys, for example – may motivate them for a little while, but they’ll eventually lose interest in doing the right thing, since they’re only doing it for the treat. And once your Elf is vacationing at the North Pole again, what’s going to keep Nora from stealing her little brother’s blocks? Kids need to know what is expected of them, and that it’s expected all year. They need to know it’s about doing the right thing, not getting presents or prizes. Santa may not be watching, but your kids are – and they’re less likely to follow the rules if they see you doing the same. If the house rule is no snacking before bed, don’t sneak a candy bar in the pantry after dinner. Just as you might ask your oldest child to make good choices to set a good example for their younger siblings, you need to remember to do the same for your children. Routines help kids know what to expect, and they also help them prioritize family responsibilities and rules over playtime, TV time or otherwise. Using the “when – then” format helps your children know exactly what’s expected of them. For example, when you clear your dishes from the table, then we can do a puzzle together. Routines help ease the chaos of the most difficult times of the day, like mornings, bedtime and homework time. Kids will know that when they brush teeth, put on pajamas and pick out clothes for tomorrow, then they can have a bedtime story. Routines will also help you and your kids navigate the craziness of holidays, vacations or other changes from the norm – so it’s important to stick to routines during these special times. 4. Focus on Consequences and Consistency. Instead of using rewards to motivate good behaviour, help your kids recognie possible negative outcomes to their choices. Let them know ahead of time what will happen if they choose to break the rules – and most importantly – follow through. Tell Aiden that if he throws snowballs at Sophia, he will have to come inside. If you see Aiden pelting snowballs at his sister from behind a snowdrift, don’t yell out a reminder. Instead, make him come inside. The next day, he’ll know what’s expected of him when he plays in the snow. The holiday season is one of the most hectic times of the year, and one of the most important to make sure you’re spending one-on-one time with your kids everyday. But it’s important every other day of the year as well. When kids get your positive attention on a regular basis, they won’t act up to get your attention in a negative way. Take time to be with your kids, doing something they choose to do, for at least 10 minutes twice a day. This small investment in time will reap huge rewards in your child’s behavior and in your relationship with your child. Help your kids keep up their good behaviour all year long with the same commitment the wait for Santa brings. 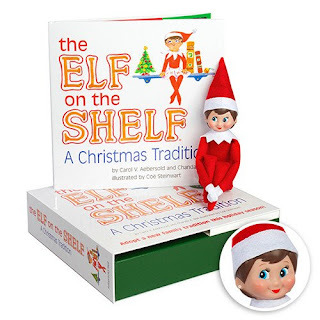 Lay the groundwork ahead of time and let the Elf be a fun addition to your Christmas traditions. Nationally recognized parenting expert Amy McCready is the Founder of Positive Parenting Solutions and the best selling author of The “Me, Me, Me” Epidemic - A Step-by-Step Guide to Raising Capable, Grateful Kids in an Over-Entitled World. In her most important role, she is the proud mom of two amazing young men.